For four years at Mizzou, I was on the rowing team. When I graduated, I ended up with about a five foot long section of an old boat we were getting rid of. After graduation, before moving, starting a new job, etc., I quickly made it into a table. Which was pretty awesome. As a boat-table, it was pretty good. But I’d always wanted to make the -table part of it better. Now that I have a house and a workbench, and a wife who only threatened to “tear that table apart” two or three times, I finally had a chance to make the table awesome. Make it cat- and eventually child-safe. 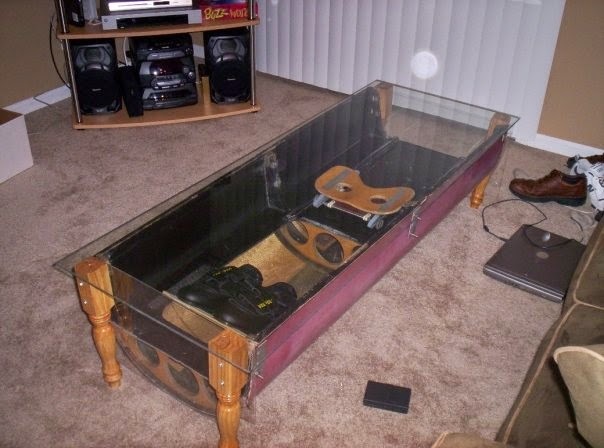 Make it a nice enough piece of furniture to not just live in the basement. I already had the boat, and I already had the piece of glass. Some of the dimensions were pretty tight, so there was a LOT of planning, measuring, drawing, and calculating. I even used graph paper. After determining how it would all fit together, the fun work began. Once again, I loaded the Altima with lumber and lugged it into the basement. Cut the frame, which was only hard because I wanted miter corners and only had a circular saw. Three sides went easily enough, but the fourth took a second try. Then right into one of the parts I was most concerned about. The boat tapers and because the glass and boat dimensions were already so close, in order to fit the boat into the table and still have room for the glass, I had to taper the insides of the two long sides. Again, tapering a five foot piece about 1 inch. With only a circular saw. That was fun. Routing the dado for the glass required building a complicated jig to keep it straight. Cut out an apron, glue and screw the frame to the apron, and glue and screw the table together. Test fit the boat – all still fits. Cut table legs to length, cut out notches so it fits around the apron just right, then glue and screw it to the table. Somehow, it was level. Then sanding. And more sanding. And sanding again. Some with the random orbital sander, some with my hand and a wood block. I only went down to 150 grit, but it seemed pretty smooth. Went out to the garage for three coats of stain and two coats of poly. 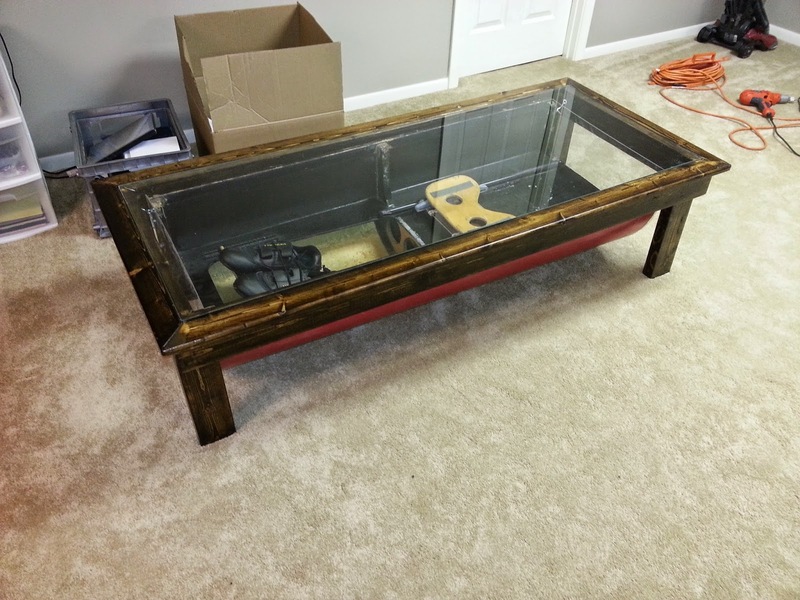 Cut some plexiglass to fit the ends of the boat, screw in some hooks, and hang the table! Currently, I need to sand my bathroom door cause I want to paint it in another color. That's why I am looking for an orbital sander for my work. Someone told me to visit here and also said to me that I could found here good quality orbital sander. What do you think about this? If you give me any suggestion about this, I would much appreciate it. Thank you.